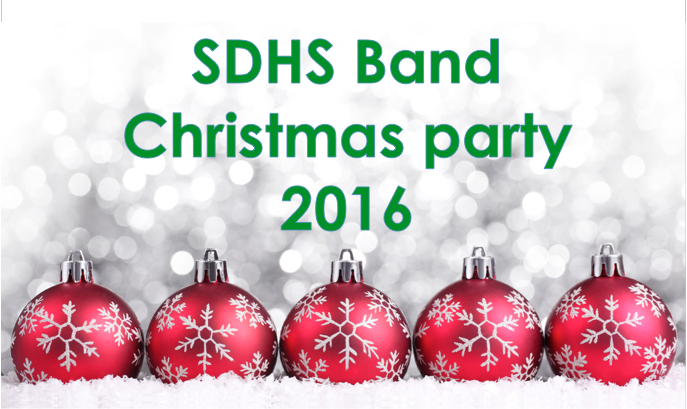 We will be having our annual band Christmas party on Friday, December 16, 2016 at Dallas Bay Baptist Church - the Met from 6pm - 8pm. We need people to sign up bring food to the party. Please sign up here. The Fruit and Cheese fundraiser order will be available for pickup on Sunday, December 4th after the Christmas Parade. Please make arrangements to pick up your fruit on Sunday after the parade until 5pm. If fruit cannot be picked up on Sunday, all fruit will need to be removed from the band room after school on Monday, December 5th. The band room will be open afterschool until the band booster meeting adjourns or 8pm, whichever comes last! The Marching Trojans will be participating in the Soddy Daisy Christmas Parade on December 4th, 2016. The band students will need to meet at the school at 12:30pm. Line-up for the Parade begins at 1:00pm and the Parade Starts at 2:00pm. The parade goes from the Daisy United Methodist Church to Food City. ALL STUDENTS WILL BE REQUIRED TO RETURN TO THE SCHOOL FOLLOWING THE PARADE!! NO PARENT NOTES!! The SDHS Winter Concert will be on Sunday, December 11th, 2016 in the New Gym at Soddy Daisy HS. Concert will start at 3pm. Students should be there at 2:15pm for warm-up. There is no charge for the concert and the students will be wearing Concert Black!